OllyDbg is able to use dbghelp.dll and symsrv.dll to show extended debug information, such as the module source code (if referenced by the debug information) or module symbols from a PDB file (which can be fetched from the Microsoft Symbol Server for system modules). The problem is that if you turn on this option, module loading becomes much slower. On the other hand, this information is very handy, so there’s a dilemma as of whether to turn it on. The Symbols on Demand plugin provides the best of both worlds: it disables loading of this extended debug information by default, but allows to load it explicitly for any module, at any time. Using this approach, loading is still fast, but if you need to load extended debug information for a module, you can easily do that. OllyDbg v1.10 and v2.01 are supported. For, OllyDbg v1.10, there’s additional functionality: you can set the symbols search path, which is set by default to SRV*.\Symbols*http://msdl.microsoft.com/download/symbols. You can also choose to retrieve undecorated symbol names. These options can be set in the INI file of OllyDbg, in the plugin’s section. Posted in Releases, Software at August 8th, 2015. 9 Comments. About a week ago, Windows 10 became generally available for updating. Today, I’m happy to present the beta version of 7+ Taskbar Tweaker, which is compatible with Windows 10. All the existing options should work, except the following advanced options: list_reverse_order and tray_icons_padding. These two options cannot be tweaked in Windows 10 using the same tricks that the tweaker used in earlier Windows versions, so they don’t work in Windows 10. I might look at reimplementing them for Windows 10 in the future. Please try the beta version, and if you encounter any issues, please let me know. Posted in Software, Updates at August 7th, 2015. 81 Comments. 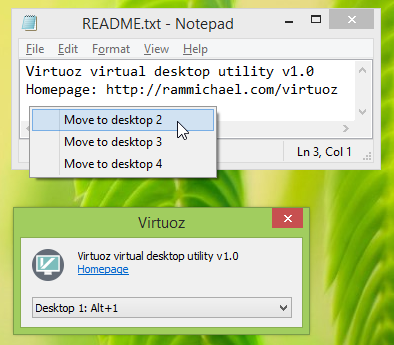 I’m happy to present Virtuoz, the virtual desktop utility. Virtuoz was designed to be a minimal and robust program that allows to have more than one desktop on Windows. It was inspired by Sysinternals Desktops, but uses a different approach, which doesn’t impose the limitations which Desktops is bound to. Virtuoz is designed for Windows 7 and Windows 8. Note that Windows 10 is not supported (Windows 10 supports virtual desktops without extra software). Posted in Releases, Software at June 28th, 2015. 53 Comments. I’m happy to announce that Unchecky has been acquired by Reason Software Company Inc., the company behind Should I remove it? and herdProtect, and has been integrated into the new Reason security product, Reason Core Security. 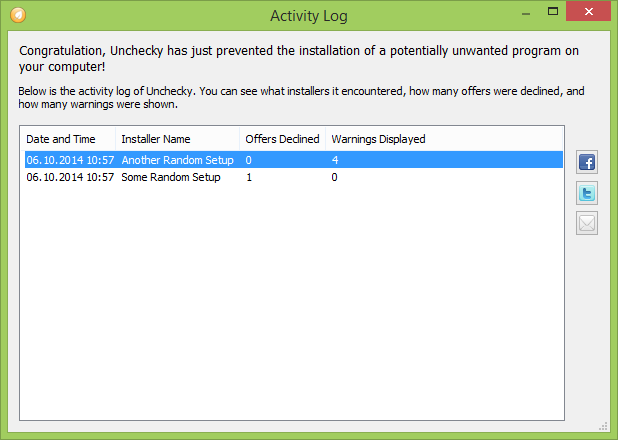 The Reason Company has a vision similar to Unchecky, which aims to protect users from potentially unwanted programs and offers. Reason Core Security is a comprehensive anti-malware security suite, designed to keep the users safe from malware, as well as to prevent accidental installations of unwanted programs. For existing Unchecky users, nothing will change: if you don’t need the power of Reason Core Security, you can continue to use Unchecky, which is not abandoned – it will continue to be developed as a standalone program as well as a Reason Core Security component. I would like to thank everybody who supported Unchecky during its development, and I’m sure that it will become a part of a great product, which will provide a comprehensive solution to the problem of malware and potentially unwanted programs. Posted in Software, Updates at April 14th, 2015. 20 Comments. This tiny plugin allows you to copy the address of the selected item/command/byte with the Ctrl+X keyboard shortcut. Posted in Releases, Software at March 17th, 2015. No Comments. This plugin makes your copy of OllyDbg portable, which means that you can copy the OllyDbg folder to another location without having to fix ollydbg.ini manually. OllyDbg v1.10 and OllyDbg v2 are supported. Copy portablizer.dll to the plugins folder. Apply the ollydbg-patch.exe patch on ollydbg.exe. The patch is needed because by default, OllyDbg loads the plugins at a later stage. Run OllyDbg from the correct folder, then close it. Make sure that the entries of ollydbg.ini contain relative paths (the [History] section). The plugin DLL file must be named portablizer.dll. Copy portablizer_odbg2.dll to the plugins folder. 7+ Taskbar Tweaking Library is a library for manipulating the taskbar of Windows 7 and above. It’s inspired by the 7+ Taskbar Tweaker program, and it allows you, as a programmer, to manipulate the Windows taskbar, which is virtually impossible to do with the documented Windows API. You can take a quick look at the provided API here. For a more extensive look, refer to the examples which are provided together with the library. Get extensive information about the taskbar items and groups on all taskbars. Reorder taskbar items, and reorder buttons within groups. Please note that the library is free for non-commercial use only. If you’re interested in using the library for a commercial application, please contact me. Posted in Programming at October 31st, 2014. 31 Comments. Windows 10 Technical Preview was recently released by Microsoft, and as you might have noticed, 7+ Taskbar Tweaker doesn’t run on it. A while ago I wrote a blog post, which answers some of the questions about 7+ Taskbar Tweaker and Windows 10. I’m happy to announce that the very first alpha version of 7+ Taskbar Tweaker for Windows 10 (Technical Preview) is ready for some testing. Those of you who have donated for the porting effort can get the alpha version here (link removed). Please note that this version is not complete. While several options work well, others don’t work as expected, and some don’t work at all. Most of these issues are known, and will be fixed in future alpha versions. v4.5.9.2 (November 7): fixed many bugs. v4.5.9.3 (November 14): fixed several bugs, and included 7+ Taskbar Tweaker beta changes (including the “disable_taskbar_transparency” advanced option). v4.5.9.4 (November 28): added support for Windows 10 Build 9879 (and dropped support for previous Windows 10 builds). v4.5.9.5 (February 21): updated for build 9926.
v4.5.9.7 (March 27): updated for build 10041.
v4.5.9.9 (May 8): updated for build 10074.
v4.5.9.10 (May 15): Korean translation. v4.5.9.11 (July 31): updated for the RTM build, 10240. Fixed several incompatibilities with Windows 10.
v4.5.9.12 (August 5): many many fixes for Windows 10. Update (August 7, 2015): The first public beta version is available! More details here. Posted in Software, Updates at October 24th, 2014. 133 Comments. A tray icon is visible as long as the Unchecky service is running. When an offer is rejected, a notification message is shown (see screenshot below). As you can see from the above screenshot, there are also social network buttons, which allow you to tell your friends and family about Unchecky. Please use them! We have great plans about Unchecky, and we need your help to spread the word. Posted in Software, Updates at October 7th, 2014. 12 Comments. Windows 10 Technical Preview was just released by Microsoft several days ago, and I’ve already received many questions about 7+ Taskbar Tweaker support for it. I’d like to answer some of those. Q: I tried to run 7+ Taskbar Tweaker on Windows 10 Preview and I get a messagebox that says it’s only for win7/8. Do you reckon it would work if you disable the windows check inside 7+ TT? A: No, that won’t work. What you’ll get instead is a different error message box, or, if you’re less lucky, an explorer crash. Q: If 7+ Taskbar Tweaker works fine on Win 8.1, I guess it’s a small adjustment to make it work in Win 10, isn’t it? A: That’s kind of correct, depending on what you’re considering as a “small adjustment”. But that’s not something that can be done in a couple of minutes. Or hours. While that’s obviously less work than writing 7+ Taskbar Tweaker from scratch, it requires careful tuning for the memory layout of the new explorer, and the fact that it looks/behaves just like explorer from Windows 8.1 doesn’t help here. Q: Can donations, as in the case Windows 8.1, accelerate the situation? A: Yes, it will help. You can donate here. Include the w10p (Windows 10 Porting) word in the donation comments to specify that your donation is targeted for the porting. Below is a progress bar of the donations, with the goal set as the estimated time the porting is going to take, with an average wage. As with the Windows 8.1 Update 1 porting progress, all donors will get access to early alpha versions during the porting process. Also, the top three donors will get mentioned in the changelog. Thanks in advance for your help! If things go well, I’ll try to allocate time for it next week. Update (October 24, 2014): The first alpha version is available! More details here. Posted in Software, Updates at October 4th, 2014. 124 Comments.